The report however concedes that the government was right to quickly settle the issue with Russia, as arbitration would have led to far higher penalties for breaking the original contract, with the prospect of having to maintain the ships for several years pending the verdict. Although clearly partisan, the report provides some interesting details on the financial aspects of the Mistral contracts, and confirms others. When Russia originally ordered the two Mistral-class LHDs in June 2011, it agreed to pay €1.2 billion, including a down payment of €893 million. 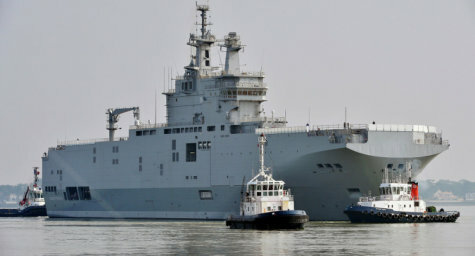 Although covered by a government-to-government memorandum, the Mistral contract was in fact signed by the Russian arms agency, Rosoboronexport, and the French DCNS shipbuilding group, to which the down payment was made. Under a separate contract, Russia also ordered four CTM-NG landing craft from the Lorient-based STX shipyard and two EDAR landing catamarans from the CNIM shipyard. After France refused to deliver the two ships because of the Ukrainian crisis, it opened negotiations with Russia on a settlement, and after months of bargaining the two agreed that France would pay Russia a total of €949.7 million. This includes payback of the €893 million down payment to DCNS and €56.7 million to reimburse Russia for its contract-related expenses, including crew training and procurement of specific equipment for the ships. On Sept 23, French President François Hollande announced that he and Egyptian President Abdel Fattah al-Sisi "have agreed on the principle and terms and conditions of Egypt's acquisition of the two Mistral-class vessels." The price was not revealed, but the Senate report estimates it as between €950 million-€960 million. On this basis, the Senate Finance Committee found that the non-delivery of the two Mistrals to Russia would cost the French state €200-€250 million, and so will not the be the cost-free operation that the government has routed to the public. The committee also notes that, while industry costs related to the Russian contract will be repaid under the export guarantee cover extended by COFACE, uninsured expenses (berthing, maintenance, removal of Russian-supplied equipment) and lost profits will cost French industry – and predominantly DCNS – “between €90 million and €146 million, depending on the outcome of ongoing negotiations,” the report states. The report also lambasts the government for having misrepresented the resale operation, and of having forced it through without following the spirit or the letter of accounting rules, but a lot of this seems to be due to partisanship, as the original sale to Russia was concluded by conservative former President Nicolas Sarkozy and was vetoed by his Socialist successor. Click here for the report (23 PDF pages, in French) on the Senate website.